In July 2013, the National Botanic Garden of Wales was visited by two eminent orchidologists from contrasting parts of the world. The first was Dr. Nicola Flanagan who, on July 6th, addressed members of the OSG. 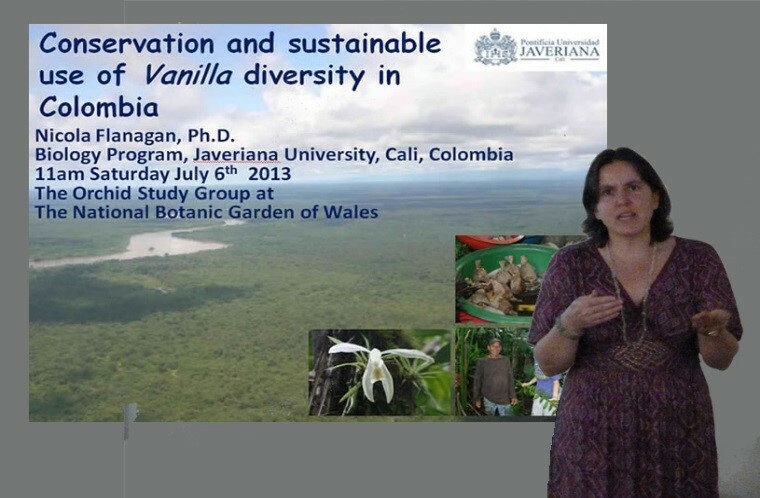 The topic of her talk was: Conservation and sustainable use of Vanilla diversity in Colombia, and this was well received by all who attended. Nicola, whose family lives in Wales, and who is herself based at Javeriana University, is co-director of the Research Group in Orchids, and Plant Ecology and Systematics in Colombia, a multi-institutional network of researchers in Cali, Popayan and the surrounding areas, mostly in South West Colombia, although her team has now started to make links with researchers in other parts of that country. Dr. Nicola Flanagan Addessing the Orchid Study Group at NBG Wales. At present, the team is investigating several lines of orchid research, including pollination biology, conservation (inventory and biodiversity studies) and mycorrhizal interactions. In recent years, its priority has been the genus Vanilla, which is seen as having potential economic application in providing sustainable livelihoods for the forest-dwelling communities inhabiting the biodiversity-rich Colombian Pacific region. Nicola highlighted the enormous potential benefits of cultivating Vanilla in that region of the world, but also the disadvantages – for example, the vining plant has to grow for many years before fruiting and, by that time, harvesting involves the use of ladders. The team members are currently preparing manuscripts relating to Vanilla phylogenetics, new species identification, plant-fungi interactions, the identification of mycorrhizal fungi associated with the genus and evaluation of Vanilla fruit aroma. Shortly afterwards, during the week commencing July 15th, Professor Malgorzata Stpiczyńska arrived from Lublin University and ÁWarsaw Botanic Garden, Poland, on an Erasmus Program studentship, and was hosted by the National Botanic Garden of Wales. She was particularly keen to visit Europe’s youngest botanic garden, contrasting it with Warsaw Botanic Garden, now reaching its second centenary. Malgorzata, who has worked with our chairman Dr. Kevin L. Davies for some 15 years on a number of research projects relating to orchid floral anatomy and floral food-reward production, and who together have co-authored a great number of publications, took the opportunity both to visit Wales and to meet Kevin for the first time. Their main fields of research include pseudopollen (food hairs) in Maxillariinae, floral oil secretion in Oncidiinae, nectar and fragrance secretion and labellar hair morphology in a range of orchid subtribes and how these characters have evolved and relate to pollination strategies. During her visit, apart from discussing future collaborative projects with Kevin, she visited the orchid collection at Singleton Gardens, Swansea and observed orchids in the field, both at NBG Wales and at Oxwich Burrows. Malgorzata was also keen to see at first-hand how NBG Wales had developed in recent years and to discuss at length the conservation of threatened native plant species, the Barcode Wales and Biodiversity project, the Welsh rare plants project and current methods of cultivation with staff at NBG Wales. She was particularly impressed with the planting and landscaping at the Garden, contrasting it with the formal systematic beds found in many of the botanic gardens of mainland Europe. Unfortunately, her decision to visit at very short notice meant that it was not possible for her to meet many OSG members, but she will be certain to do so when she next returns. Professor Malgorzata Stpiczyńska orchid-hunting at Oxwich burrows.